The latest radio chip for the Internet-of-Things (IoT) from STMicroelectronics, a global semiconductor leader serving customers across the spectrum of electronics applications, delivers extremely high energy efficiency for smart connected objects to operate for up to 10 years without replacing batteries. ST’s new S2-LP transceiver is ideal for networked devices, such as alarm systems, surveillance equipment and smart energy-metering solutions, as well as long-range radio links used to connect devices like remote sensors directly to the Cloud without a local gateway. Other applications include building automation, industrial monitoring and control, and systems for managing lighting, traffic, or parking in smart cities. The device operates in unlicensed sub-1GHz frequency bands, which are available globally. Ultra-narrowband operation allows highly efficient use of radio spectrum and reliable data exchange up to long distances using low-power signals. Supports point-to-point, star, as well as mesh networking topologies thus resulting in a very flexible wireless transceiver for connected objects. Delivers extremely low power consumption, drawing only 6.7mA in receive mode, and 10mA when transmitting at 10dBm. Sleep and standby modes reduce the current to just 600nA and 350nA, respectively. Receiver sensitivity of -130dBm enables operation over distances up to several hundred kilometers, depending on the environment, thus enabling wide-area coverage. Is a flexible solution that can be programmed for operation in multiple worldwide sub-1GHz ISM frequency band: support for Sigfox, Wireless M-Bus and 6LowPAN, as well as IEEE 802.15.4g, which is suitable for home energy-management systems. 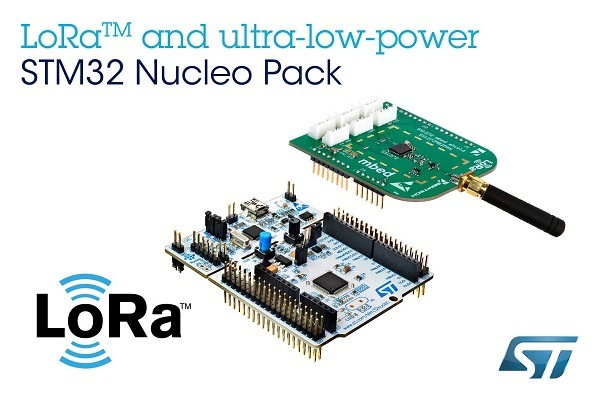 Leverages a full-featured Software Development Kit (SDK) compatible with the STM32 microcontroller family that has proven credentials in the energy-conscious IoT space, and with the extensive STM32 development ecosystem including prototype boards and rich software tools and resources. Is Sigfox-ready and comes with a pre-certified Development Kit enabling immediate connectivity to the Sigfox network for evaluation and easy prototyping purposes.